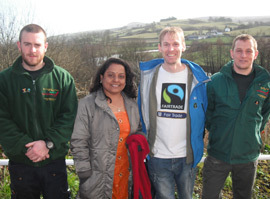 The Carmarthenshire Fairtrade Group have worked with Carmarthenshire Council’s Rights Of Way team to plan and waymark the first official Fair Trade Way in Wales, which links the Fairtrade Towns of Ammanford and Carmarthen. Ammanford was the first town in Wales to achieve Fairtrade Town status back in 2002. The route goes along the beautiful Towy Valley. Using established routes along St illtyd’s Way, The Gower Way and The National Cycle Network, this route goes from Ammanford Fairtrade Town, where it joins up with the above Carmarthenshire Fair Trade Way, to Swansea Fairtrade City, where it joins up with the Swansea Bay Fair Trade Way (See below). For the route of Ammanford to Swansea Fair Trade Way see the leaflet Fair Trade Walks from Ammanford: leaflet front page – leaflet back page (to use these maps you also need to refer to OS landranger map 159), or click here for the three sections of a longer route planned by City and County of Swansea rangers incorporating local trails. A perfect walk for a Fair Trade Family! A flat and easy to follow walk along a well maintained foot and cycle path, or on the beach if you prefer. There are a wide variety of Fairtrade cafes in Swansea you could start from. Check the city’s fairtrade directory at http://www.fairtradeswansea.org.uk for ideas. If you don’t want to go into the city centre, a good place to start is County Hall on Oystermouth Road, right on the seafront, and with a library and a Fairtrade cafe as good meeting points. The full walk to The Red Cafe is about 5 miles long. Just follow the path through to The Mumbles. When you see the childrens’ playground cross the road; The Red Cafe is there, at 644 – 646 Mumbles Road, Mumbles Swansea, SA3 3EA. It is a community cafe and youth project, doing lots of good work around fair trade in the community. But be aware they are not open to the public everyday, so best to phone first to check if you are hoping to eat or drink there. 01792 362122. www.redcafe.org.uk A shorter walk, good for a hot day with kids, could finish half way, at The Junction, by the Lido at Blackpill. The Monmouthshire Fair Trade County Group have established a fantastic series of Fair Trade Ways linking the four Fair Trade towns of Chepstow, Monmouth, Abergavenny and Usk. These follow the well established and picturesque routes of the Usk Valley Walk, The Wye Valley Walk and the Offa’s Dyke Path. These routes are also being promoted as cycle routes. There are lots of possibilities with this one! Why not camp at the beautiful Caerfai Farm campsite, with its own shop full of Fairtrade and local and organic produce. www.caerfaifarm.co.uk From there you could go on a small circular walk to St Davids, a town full of places supporting Fairtrade, and local organic products too. The Refectory at St David’s Cathedral serve Fairtrade drinks and snacks, so you could stop there and reflect on St David’s words : ”Do the little things in life.” Buying Fairtrade is a little thing which can make a big difference. Or, for the more serious walkers among you, you could venture onwards and upwards and over the border into Ceredigion to Mwnt; a picture postcard small white chapel above a beautiful beach, which will welcome you with a notice proudly stating : “We are a Fairtrade Church”! 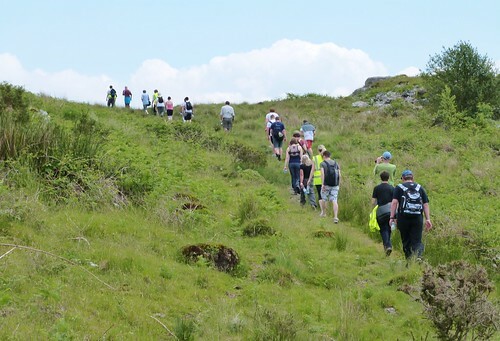 With the opening of the Welsh Coastal Path, there is now a walk all around the Welsh coast. As Wales is the First Fairtrade Nation in the world, surely we can claim the coastal path as a Fair Trade Way!